Internationally recognized for his moving performances, innovative programming and extensive catalog of recordings, American conductor Gerard Schwarz serves as Music Director of the All-Star Orchestra, an ensemble of top musicians from America’s leading orchestras featured in sixteen television programs that have aired throughout the United States on public television, worldwide by internet streaming and is the basis for their Khan Academy education platform that has already reached over 6 million students. As in baseball, Schwarz created an “all-star” team of top musical athletes to encourage a greater understanding and enjoyment of classical music. All programs are released by Naxos on DVD and have been awarded six Emmy Awards and an ASCAP Award. Schwarz also serves as Music Director of the Eastern Music Festival in North Carolina and Mozart Orchestra of New York, Conductor Laureate of the Seattle Symphony, and Conductor Emeritus of the Mostly Mozart Festival. From the fall of 2019 he will assume the position as Distinguished Professor of Music; Conducting and Orchestral Studies of the Frost School of Music at the University of Miami. His book “Behind the Baton” was released by Amadeus Press in March 2017. With more than 300 world premieres to his credit, Schwarz has always felt strongly about commissioning and performing new music. A new initiative with the Eastern Music Festival and the Bonnie McElveen Hunter Commissioning Project brings ten new world premieres from American composers to the festival over a period of ten years. Works by Richard Danielpour, John Corigliano, Lowell Lieberman, HyeKyung Lee, Augusta Reed Thomas, and André Previn are amongst premieres so far presented. During Schwarz’s tenure with the festival, he has expanded audiences to the largest in its history, incorporated a composer in residence program, developed three new concert series and increased the focus on new works with 24 world premieres over the last four seasons. A prolific recording artist, Schwarz’s total discography numbers over 350 on more than 11 labels. The Gerard Schwarz Collection, a 30 CD boxed set of previously unreleased and limited release works spanning his entire recording career was released by Naxos in November 2017. His pioneering cycles of American symphonists such as William Schuman, David Diamond and Howard Hanson have received high critical praise, as have his acclaimed series of Stravinsky ballets, symphony cycles of Robert Schumann, Gustav Mahler and Dmitri Shostakovich as well as his orchestral works of Richard Wagner, Richard Strauss and Rimsky-Korsakov. More than 50 discs featuring Gerard Schwarz and the Seattle Symphony – with works by 54 composers ranging from the Baroque to contemporary periods – were released in the last two years. 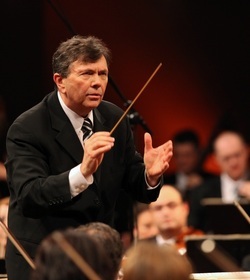 In addition to his numerous recordings with the Seattle Symphony, he has also recorded with the Berlin Radio Symphony, Czech Philharmonic, English Chamber Orchestra, Juilliard Orchestra, London Symphony, Los Angeles Chamber Symphony, New York Chamber Symphony, Orchestre National de France, Philadelphia Orchestra, Royal Liverpool Philharmonic, Tokyo Philharmonic and Eastern Music Festival. A sought-after guest conductor, Schwarz has led many of the world’s greatest orchestras and Opera companies. He has appeared with the Juilliard Opera, Kirov Opera, Mostly Mozart Festival, San Francisco Opera, Seattle Opera and Washington National Opera and has led 21 productions with the Seattle Opera. A graduate of The Juilliard School, Schwarz joined the New York Philharmonic in 1972 as co-principal trumpet, a position he held until 1977. Schwarz’s numerous previous positions include Music Director of New York’s Mostly Mozart Festival, Music Director of the Royal Liverpool Philharmonic, Music Director of the Los Angeles Chamber Orchestra and New York Chamber Symphony, and Artistic Advisor to the Tokyo Philharmonic. Schwarz is a renowned interpreter of 19th century German, Austrian and Russian repertoire in addition to his noted work with contemporary American composers. He completed his final season as music director of the Seattle Symphony in 2011 after an acclaimed 26 years – a period of dramatic artistic growth for the ensemble. He was instrumental in the building of Benaroya Hall, amassed a critically acclaimed discography of more than 140 recordings; numerous television programs and concert broadcasts; implemented music education programs including new series and the successful Soundbridge Center and significantly increased audience attendance. In his nearly five decades as a respected classical musician and conductor, Schwarz has received hundreds of honors and accolades including six Emmy Awards, 14 GRAMMY nominations, eight ASCAP Awards and numerous Stereo Review and Ovation Awards. He holds the Ditson Conductor’s Award from Columbia University, was the first American named Conductor of the Year by Musical America and has received numerous honorary doctorates. The City of Seattle recognized his outstanding achievements and named the street alongside the Benaroya Hall “Gerard Schwarz Place,” and the State of Washington gave him the honorary title of “General” for his extraordinary contributions as an artist and citizen.